1 – McSwigan Mackie, Border Collie (owner Laura Ohlrich, Eustis, Fla.). 2 – Cassia’s Nonstop Annabelle, Australian Shepherd (owner Megan Brew Mann, Mt. Dora, Fla.). 3 – Bylucs Chshivaree Serenade, Smooth Collie (owner Lynn Roberts, Orlando, Fla.). 4 – Moon Shadows Spirit of Aurora, Shiloh Shepherd (owner Cherry Moon, Fruitland Park, Fla.). 1 – CH Byluc’s Roxy In High Gear at Five Oaks CGC PT BN, Smooth Collie (owner Robin Lynne Hammel and Tasha Byerly, Orlando, Fla.). 2 – Kurly Kreek Charmstar Flying To Fame, Curly-Coated Retriever (owner Ann Shenkle, Grand Island, Fla.). 3 – CH Byluc’s Pandora of Spruce Run CGC TDN BN, Smooth Collie (owners Ted L. Green, Robin L. Hammel and Tasha Byerly, Orlando, Fla.). 1 – Magik’s Top of the Line CD RN, Golden Retriever (owner Ann Rowe, Sorrento, Fla.). 1 – Portadown Nucky Cubby Bear Adams, Australian Cattle Dog (owner Jeanne Adams, Eustis, Fla.). 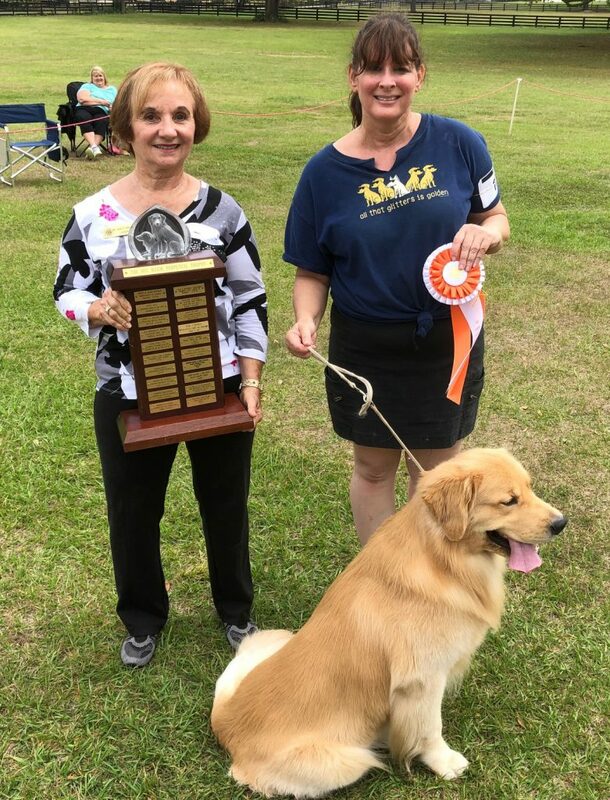 2 – Topbrass Code of Honor, Golden Retriever (owner Karyn Angel, DeLand, Fla.). McSwigan (Mackie), Border Collie (owner Laura Ohlrich, Eustis, Fla.). Topbrass Code of Honor, Golden Retriever (owner Karyn Angel, DeLand, Fla.). 1 – Jazzie’s Magik’s Hook Em Horns, Golden Retriever (owner Ann Rowe, Sorrento, Fla.). 2 – Snobird’s Spring Firefly, Golden Retriever (owner Alan and Laura Wright, Mt. Dora, Fla., and Deborah Caudill, Ocklawaha, Fla.). 3 — Misty Ridge Lillie Santa Lucia RI, Golden Retriever (owner Paula Black, Sorrento, Fla.). 4 – CH Snobird’s Yule Unger for More CGC CCA, Golden Retriever (owner Debbie Caudill, Ocklawaha, Fla.). Jazzie’s Magik’s Hook Em Horns, Golden Retriever (owner Ann Rowe, Sorrento, Fla.).